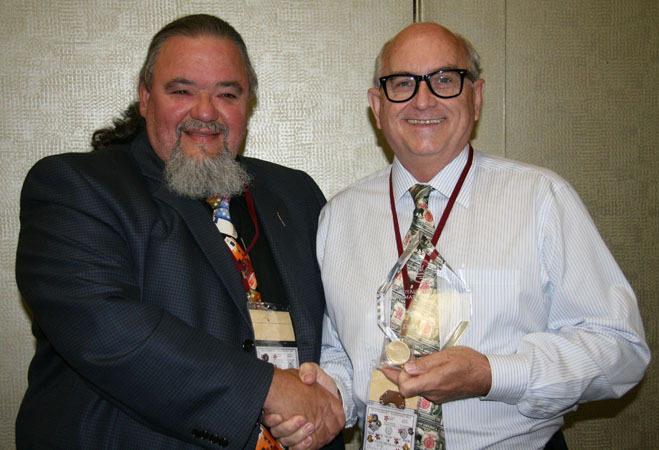 Chris Faulkner (right) receiving the J. Douglas Ferguson Award from Ron Greene (left). Norm Williams (right) accepting the Paul Fiooca Award from Charles Moore and Bill Waychison (left). 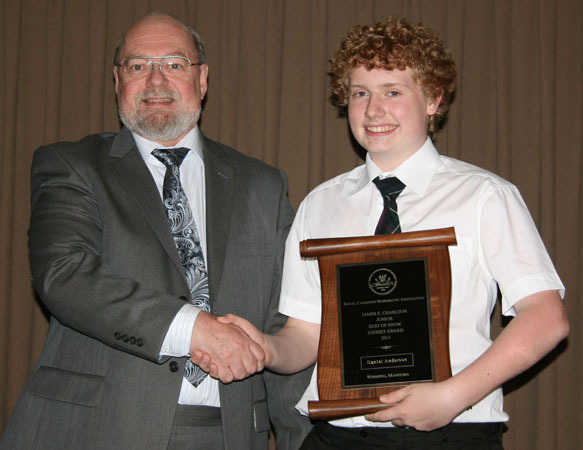 The Paul Fiocca Award is the highest award given by the Royal Canadian Numismatic Association. 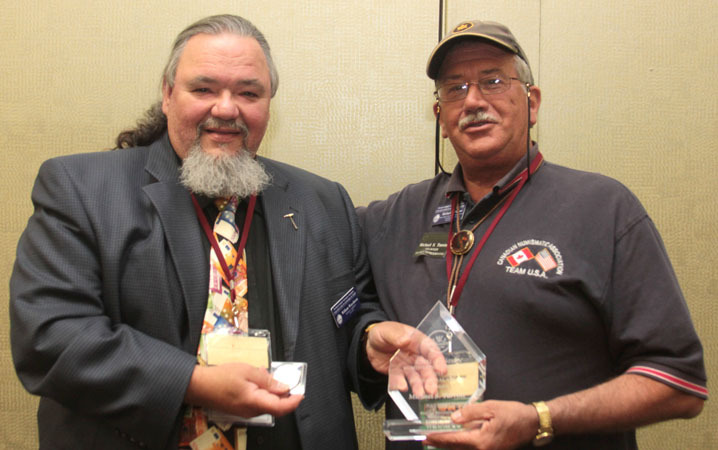 The award is presented annually for “Long term meritorious service or major contributions to the RCNA” and is an award not just to recognize the elite of the hobby, but any individual who may have worked behind the scenes, often for many decades, for the betterment of the Association. 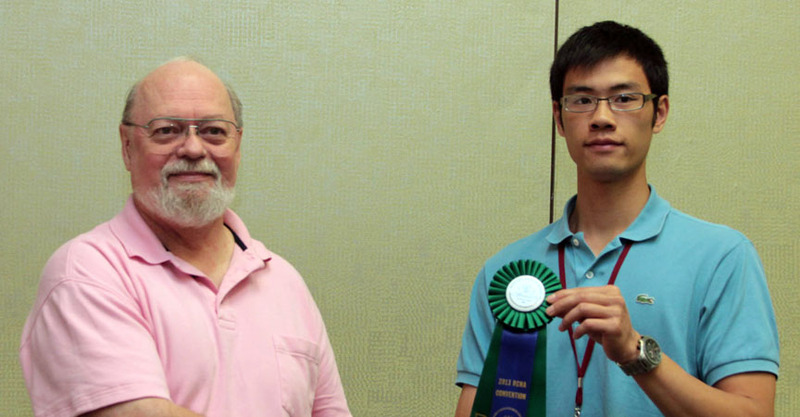 George Cuhaj (right) receiving the Sheldon Carroll "Best of Show" Exhibit Award from Tim Henderson. 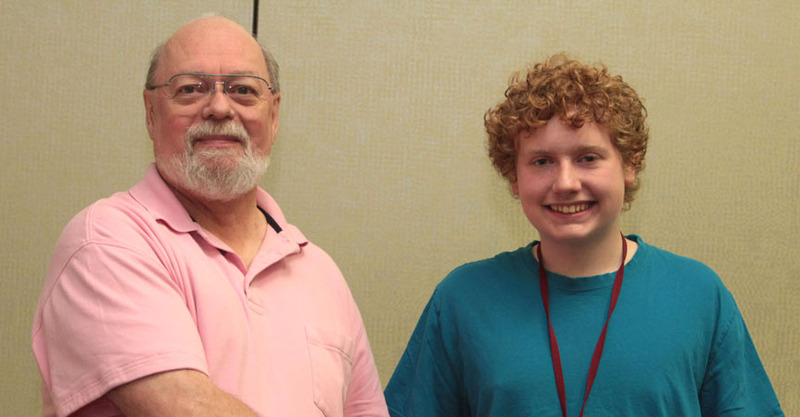 Daniel Anderson (right) receiving the James E. Charlton Junior Exhibit Award from Tim Henderson. 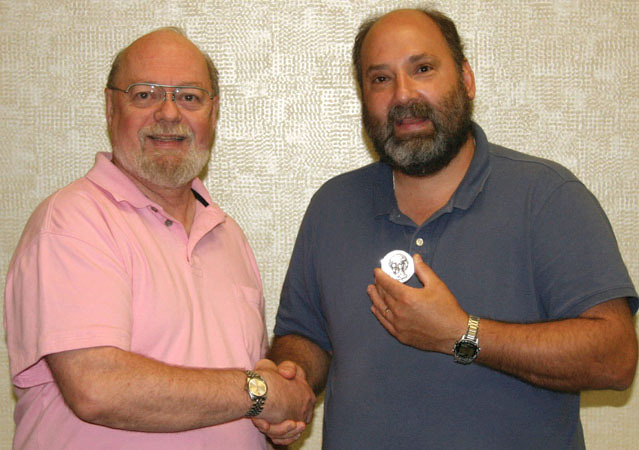 Serge Pelletier (right) receiving Fellow of The Royal Canadian Numismatic Association from Tim Henderson. 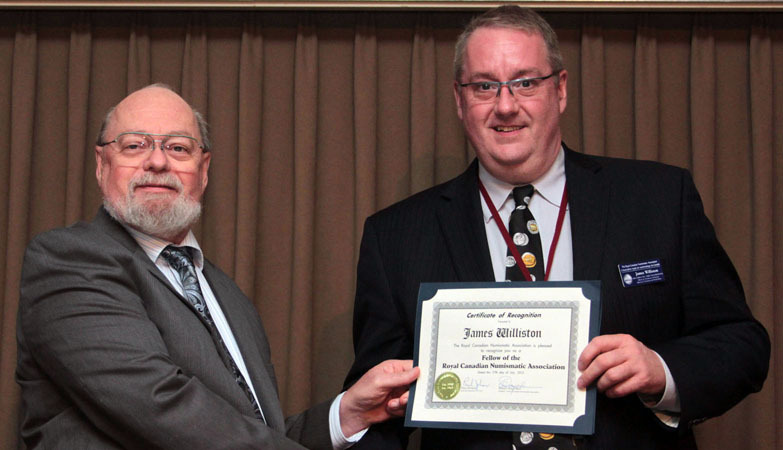 James Williston (right) receiving Fellow of The Royal Canadian Numismatic Association from Tim Henderson. 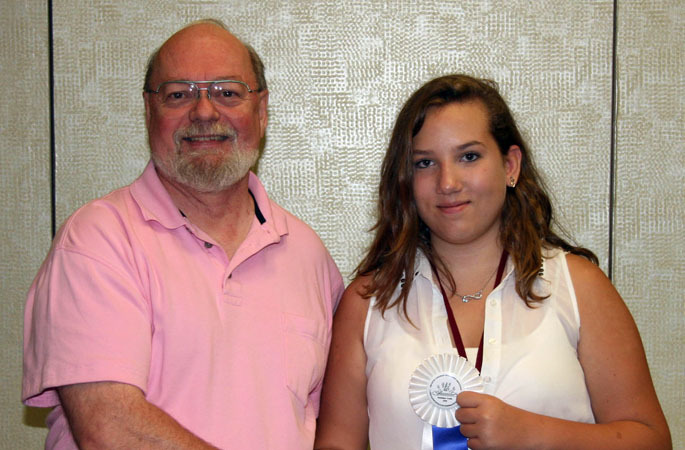 France Waychison (right) receiving a Presidential Award from Bill Waychison. 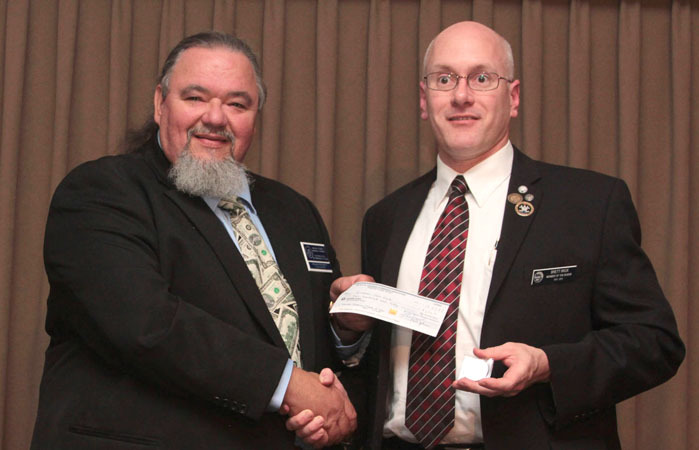 Daniel Gosling (right) receiving a Presidential Award from Bill Waychison. 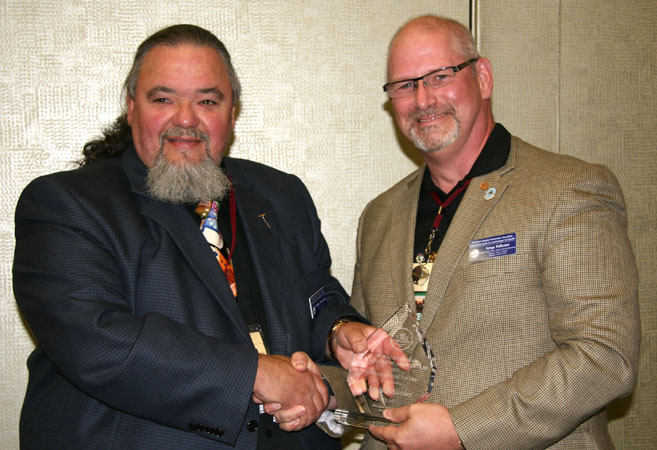 Tim Henderson (right) receiving a Presidential Award from Bill Waychison. 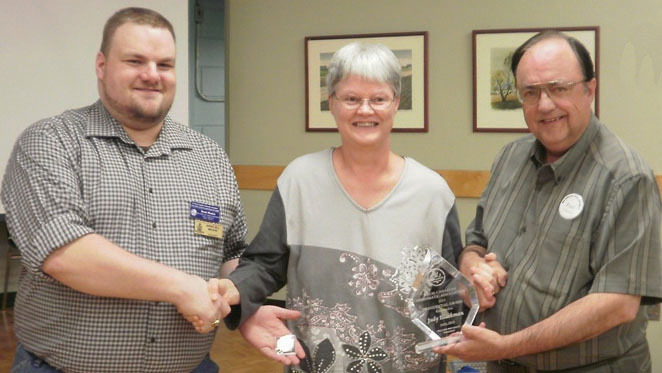 Judy Blackman (centre) with her RCNA Presidential Award presented to her by Brent Mackie (left) and Paul Johnson (right). 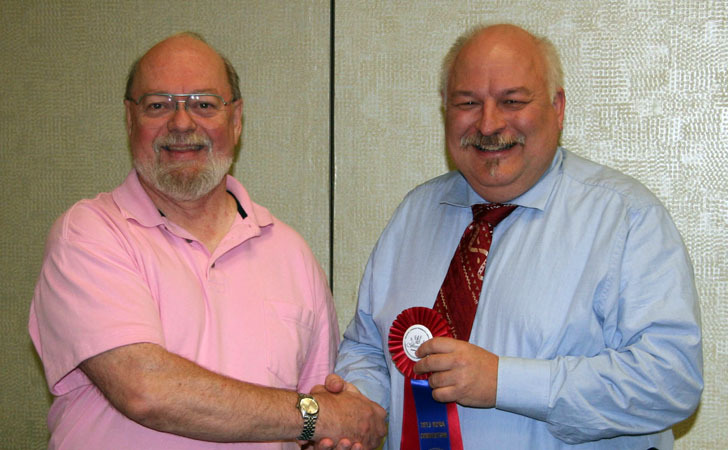 Michael Turrini (right) receiving a Presidential Award from Bill Waychison. 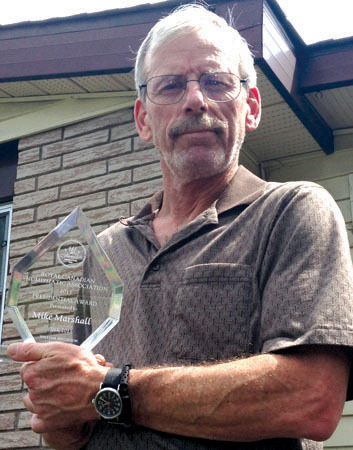 Mike Marshall (left) with his Presidential Award. 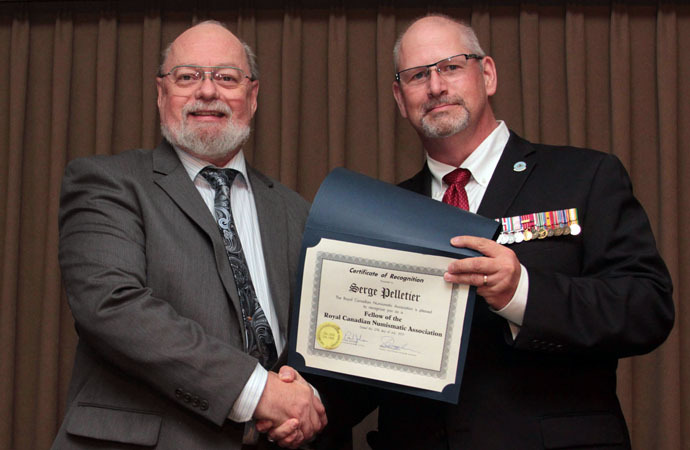 Serge Pelletier (right) receiving a Presidential Award from Bill Waychison. 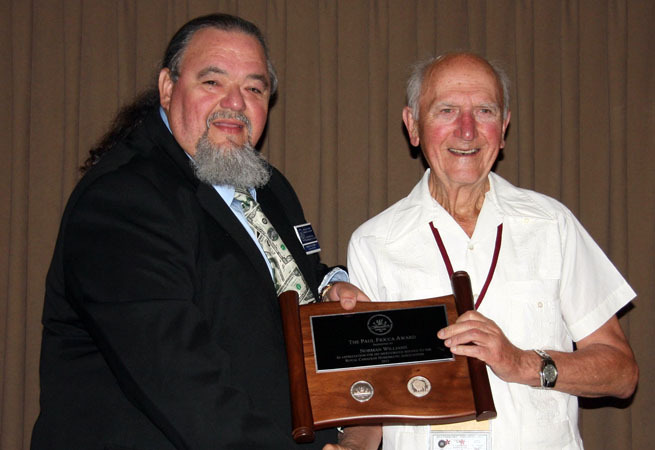 James E. Charlton recipient of a Presidential Award from Bill Waychison (No photo). 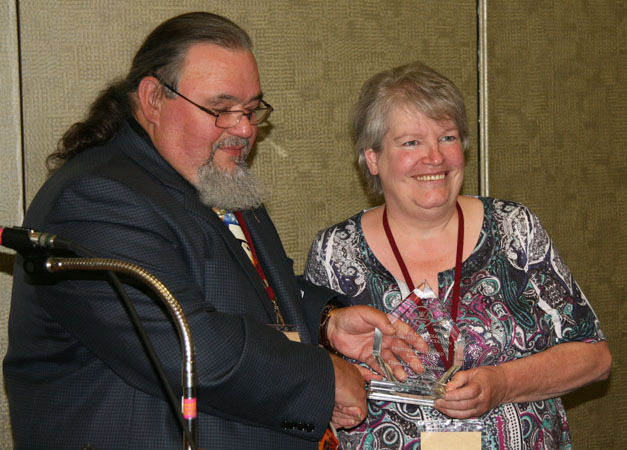 Dr. Marvin Kay is the recipient of the Guy Potter Literary Award. 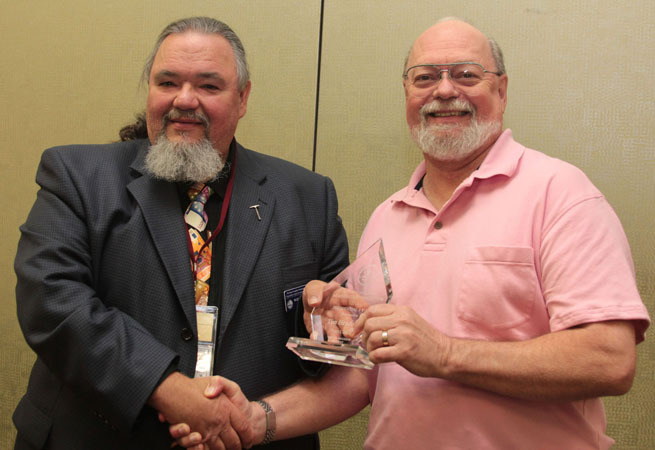 David Bergeron is the recipient of the Jerome Remick III Literary Award for the best article in a RCNA member club newsletter. 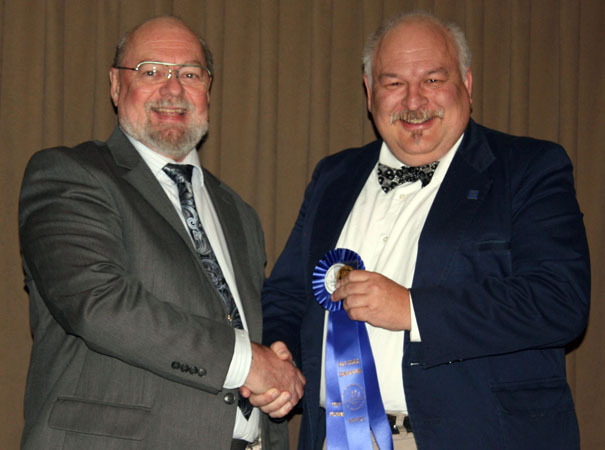 Renald Lefebvre is the recipient of the the Best National/National Newsletter Award for Bulletin de Liaison (a publication of the Société numismatique de Québec). 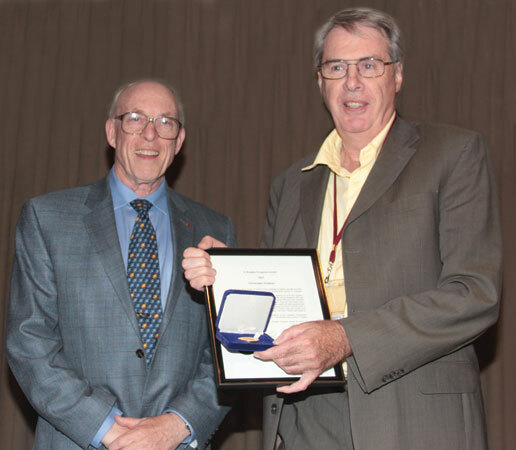 Renald Lefebvre is the recipient of the Best National or Regional Editor for 2012 for the Best National Newsletter Bulletin de Liaison (a publication of the Société numismatique de Québec). Brett Irick (right), Windsor Coin Club receiving the Louise Graham Memorial "Club of the Year" Award for 2013 from Bill Waychison. 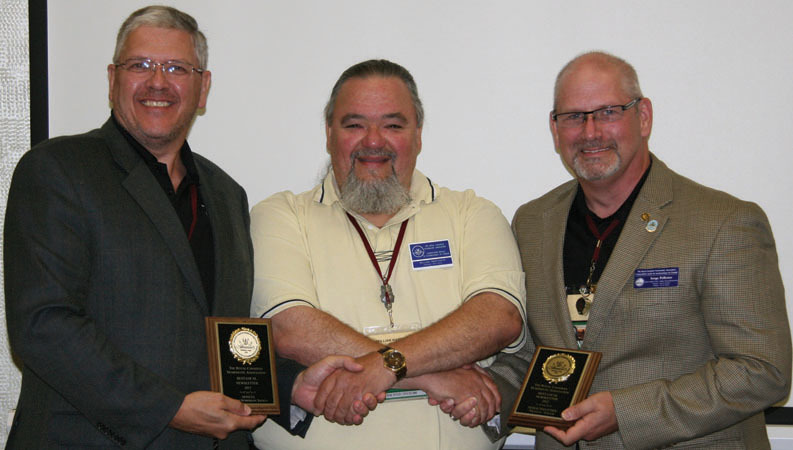 Serge Pelletier (right), editor Moneta, (a publication of the Ottawa Numismatic Society / Société numismatique d'Ottawa), and Steve Woodland (left), President ONS-SNO, receiving the Best Local Club Editor Award and the Best Local Club Newsletter Award, respectively, from Bill Waychison (centre). 1st Chris Boyer (right) "A J.O.P. Dollar"
2nd Ermin Chow (centre) "Canada's Wildlife Silver Coin Series"
3rd Armand Martin (no photo) "Canadian Silver Wolf Pack"
1st Ron Greene (right) "Hudson’s Bay Company Long Service Medals"
2nd Alan Roy (centre) "Medals of the Winnipeg Branch of the Royal Canadian Mint"
1st Ermin Chow (right) "Three Cent Type Coins of the United States"
1st George Cuhaj (right) "The Pennsylvania Railroad’s Medal for Heroic Service"
1st Kirsten Boyer (right) "Manitoba Moments"
1st Daniel Anderson (right) "18th Century British Provincial Tokens"
Chris Boyer (right) receiving the Jean Bullen Award from Tim Henderson (left).